We’d love your help. Let us know what’s wrong with this preview of Compromised Positions by Katherine Elaine Bliss. 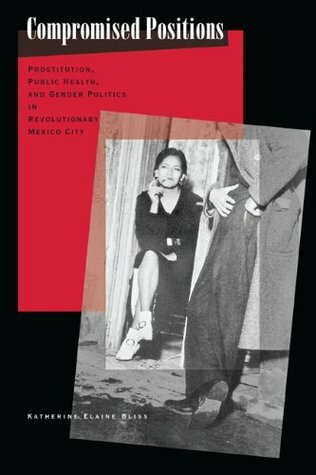 To illuminate the complex cultural foundations of state formation in modern Mexico, Compromised Positions explains how and why female prostitution became politicized in the context of revolutionary social reform between 1910 and 1940. Focusing on the public debates over legalized sexual commerce and the spread of sexually transmitted disease in the first half of the twenti To illuminate the complex cultural foundations of state formation in modern Mexico, Compromised Positions explains how and why female prostitution became politicized in the context of revolutionary social reform between 1910 and 1940. Focusing on the public debates over legalized sexual commerce and the spread of sexually transmitted disease in the first half of the twentieth century, Katherine Bliss argues that political change was compromised time and again by reformers' own antiquated ideas about gender and class, by prostitutes' outrage over official attempts to undermine their livelihood, and by clients' unwillingness to forgo visiting brothels despite revolutionary campaigns to promote monogamy, sexual education, and awareness of the health risks associated with sexual promiscuity. To ask other readers questions about Compromised Positions, please sign up. Well-written with lots of fun anecdotes. Like City of Suspects, it does a good job of demonstrating how Porfirian policies and ideologies lingered long into the post-Revolutionary era, even as the leaders of that time consciously sought to reject the past. A history of the regulation of Prostitution in Mexico in the early 20th century. Interesting discussion of the political importance to regulating health and gender (through prostitution).